Keen Koala: 8 Awesome Benefits Of Owning Houseplants! 8 Awesome Benefits Of Owning Houseplants! I simply adore houseplants. Let me just do a quick tally, I own 17 different houseplants. From cacti to succulents to tropicals, I love them all. 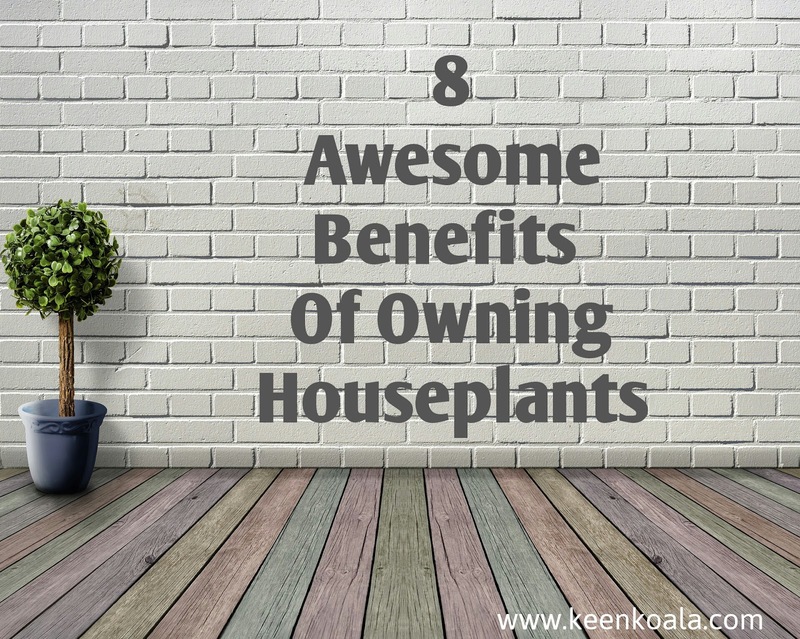 And I'm guessing you do too, which is why you're here to see 8 awesome benefits of owning houseplants! 1. Houseplants can help purify the air. Did you know that houseplants absorb carbon dioxide and many other VOCs? Well it's true! Check out this awesome article by LIVESCIENCE for more information by clicking HERE. 2. Houseplants can enhance your mood. Studies show that being around plant life can reduce stress and improve a person's feeling of well being. Find out more in this article by Psychology Today by clicking HERE. 3. Houseplants make great inexpensive home decor pieces. Outfitting a home with beautiful decor items can get pricey really fast. Houseplants are classy and visually interesting and can be very inexpensive or even free if your friends are willing to donate you cuttings. Check out this awesome article about how you can grow your own plants from cuttings by clicking HERE. 4. Plants can increase the humidity levels in your house. Do you suffer from dry, stuffy winter air? Houseplants will add moisture to the air naturally without the expense of purchasing and running a humidifier. 5. Some plants perform double duty by being both decor pieces and food. Did you know that you can grow both celery, green onions, and leaf lettuce easily in pots? This is a great way to get a little extra fresh greens into your diet all winter long. 6. Certain plants are both beautiful and functional. For example, aloe vera plants are very visually interesting, but did you know that the juice inside of an aloe leaf can be used to soothe the symptoms of some minor skin conditions. 7. They are great way to break the ice. Whenever I have guests over, they always ask me questions about my plants. It's a great pleasant topic of conversation. 8. Once a plant is established, you can propagate it into new plants and give them as gifts or sell them to make some extra pocket money. It's so easy to propagate plants from cuttings or offsets. If you look around on the Keen Koala website, there are tons of tutorials about how to propagate many of the most popular houseplants out there. And there you have it. 8 pretty cool benefits of owning houseplants. If you enjoyed this article. Please like us on Facebook by clicking HERE.